D.C. based artist Charles Bergen will be turning nine defunct call boxes in downtown D.C. into public art as a tribute to nine women who made history in the area. The project on which $176,000 will be spent is funded by DowntownDC Business Improvement District and the D.C. Commission on Arts and Humanities. “I hope to touch people and teach them a little about history. If they’re just walking by on the way to work, they’ll be like, ‘Why is that painted funny colors?’,” said Bergen. The women to be profiled were selected by Bergen with the help of urban historian Mara Cherkasky of Prologue DC. The women include D.C. Statehood Party activist Josephine Butler; publisher of the Washington Post Katharine Graham; author of “The Battle Hymn of the Republic” Julia Ward Howe, Gospel street musician Flora Molton; the publisher of the Washington Times-Herald Cissy Patterson; National Woman’s Party leader Alice Paul, civil rights activist Mary Church Terrell, and expressionist painter Alma Thomas. Bergen hopes to begin correcting the imbalance of the lack of female sculptures downtown. “In D.C., while there are lots of sculptures of men and allegorical sculptures of women, there are not many sculptures of actual, real women that you can put a name to,” he said. Bergen worked on designing the box along with four interns from city’s Marion Barry youth employment program. A sculpture will be kept inside each call box and a metal element painted on top will represent the subject. 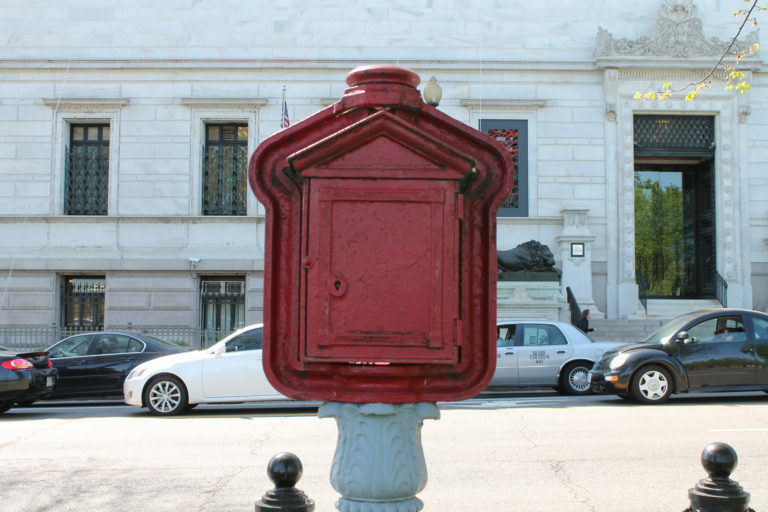 Call boxes, which are cast-iron devices, are found all over D.C. and have not been in official use since the 1970s. Call boxes in the city have been turned into art markers earlier as well. About 145 call boxes were turned into art pieces from 2000 to 2009 by artists under Art on Call, a Tourism DC project. “The call boxes place the art in the middle of the everyday. They’re never closed. You can see them 24/7,” said Bergen. The redesigned call boxes will be located at 15th & L streets, Vermont & K streets, 14th & H streets, 14th & G streets, 14th & F streets, 14th Street and Pennsylvania Avenue. Two more boxes will be located at 13th and G streets. The call boxes will be unveiled in early spring of 2019, according to the DowntownBID.